Francisco Plaza, built in 1862, is one of the first residences in the Cuchara Valley. 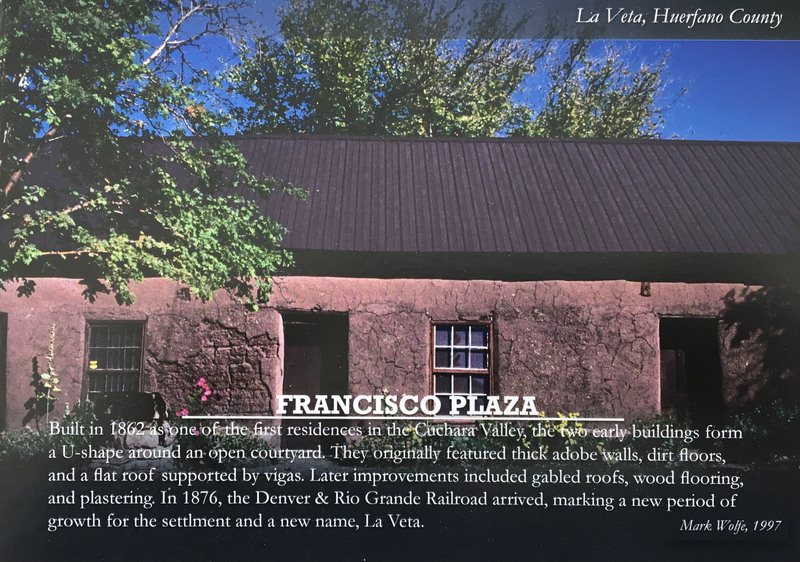 Built in 1862 as the first permanent dwelling in the Cucharas Valley, the original portion of Francisco Plaza in La Veta, Colorado consists of two adobe buildings forming an open courtyard. Traders and ranchers Colonel John M. Francisco and Henry Daigre purchased the land in 1861 from the Vigil-St. Vrain Land Grant. The settlement that grew around the defensive fort and supply center became a socio-economic center for a community of Hispanic and Anglo settlers. From 1871 to 1876, the plaza hosted the first post office, known as Spanish Peaks. After the 1876 arrival of the Denver & Rio Grande Railroad, the settlement acted as a temporary terminus and the plaza became a hotel, general store and freighting center, telegraph office, and depot. La Veta was not officially incorporated until 1886. By 1895, alterations had transformed the building into a Territorial style, including later interior doors and a partially gabled roof. The Huerfano County Historical Society opened Francisco Plaza as a museum in 1958, eventually relocating additional historic buildings to the property. The Office of Archaeology and Historic Preservation’s Heritage Diversity Initiative seeks to celebrate the historic places significant to people of every language, culture, and background that comprise the Colorado story. Check out the growing list of historic places, including those related to Hispanic heritage contributions to American history, at: www.historypin.org/en/person/75043. Submit your own story as well, either there or at: www.historycolorado.org/oahp/heritage-diversity-initiative. The National Register of Historic Places and Colorado State Register of Historic Properties are tools that recognize National Hispanic Heritage Month, celebrated mid-September to mid-October. The National Register of Historic Places is the official list of the Nation's historic places worthy of preservation. Authorized by the National Historic Preservation Act of 1966, the National Park Service's National Register of Historic Places is part of a national program to coordinate and support public and private efforts to identify, evaluate, and protect America's historic and archeological resources. The Colorado State Register of Historic Properties is a listing of the state’s significant cultural resources worthy of preservation for the future education and enjoyment of Colorado’s residents and visitors. Properties listed in the National Register of Historic Places are automatically placed in the Colorado State Register. They may also be nominated separately to the Colorado State Register without inclusion in the National Register.